Aside from the Jordan CP3.VI and the Jordan Melo M9, the Jordan Brand 2013 All-Star Collection will also feature a new edition of the first-ever Air Jordan model. Hitting the market on February 16 is the “All Star” edition of the Air Jordan 1 Mid, which is officially listed as the Black/Electric Green – Canyon Purple – Pure Violet. 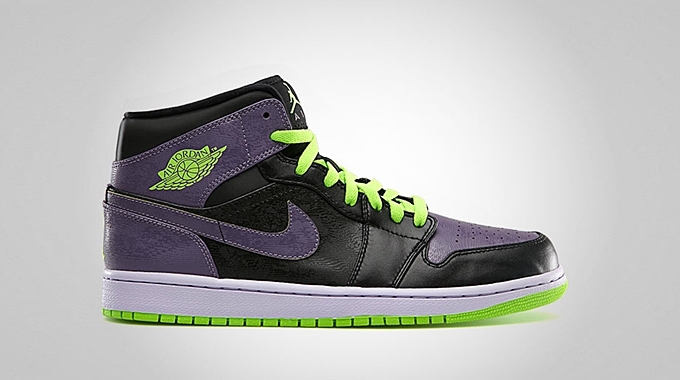 The upper part features a combination of black and canyon purple leather accented with pure violet linings and electric green Jumpman brandings and laces. Watch out for this on Saturday and make sure to consider this kick as one of your must-buys this weekend!